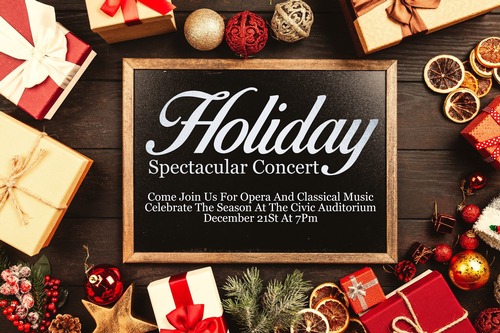 Come join us celebrate the Season and the Civic Auditorium December 21st at 7PM with a Holiday Spectacular Concert! Globetrotting Opera Gal Anna Viemeister is thrilled to come back to her hometown to bring another fantastic concert full of Opera, Carols, Jazz and more; This time to honor our Veterans at the Civic Auditorium! The Dalles Civic Auditorium was built as a memorial to our Veterans. It shows foresight in providing a community center with a space for every pastime of the era including live music! Anna will be joined by International Maestro Francisco Miranda on Piano, Fellow NYC/PDX Hybrid Lyric Tenor Samuel Varhan, Local Jazz Diva Katherina Blackmar, Members of the Cascade Singers and more! Events and Marketing Manager Skot Barker is hard at work in collaboration to create a true gem to support and celebrate the restoration of the Theatre at the Civic with a Maiden Voyage of live acoustic classical music in the last decade!